Germanium Fuzz Faces get all the respect from vintage-aligned connoisseurs. But for all their many and real virtues—great attenuation dynamics, wider spectrum of fuzz shades—the searing, pure nastiness of silicon variations can be a delight. 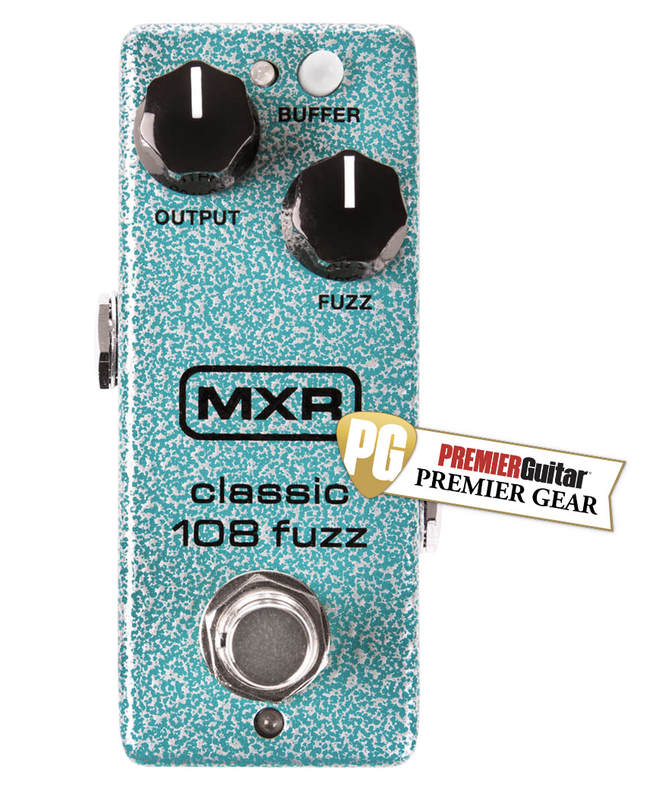 While not a Fuzz Face in name, the Classic 108 Fuzz (Mini) is essentially the same circuit that’s in Dunlop’s Jimi Hendrix Fuzz Face. In terms of bang-for-buck, it’s one of the best tools for probing the silicon Fuzz Face recipe. The basic voice (without buffer) is rich and perhaps darker and fuller than you might associate with a silicon Fuzz Face. I’ve played several of the ’90s silicon Fuzz Faces that tarnished the pedal’s good name for a while, and this version (like several others in the Dunlop line) is a vast improvement. The basic voice (without buffer) is rich and perhaps darker and fuller than you might associate with a silicon Fuzz Face. But I love the slightly duskier shade—especially when I double down with guitar tone attenuation—and “dark” here is a very relative term. With the buffer on, the 108 is brighter and, as advertised, behaves much more predictably when there’s a wah in front. (Though I personally love the strangled chaos that comes with non-buffered wah recipes.) There’s a lot of flexibility here. Factor in the convenience of the mini enclosure and the Classic 108 adds up to a very sweet—and sweetly fuzzy—deal. The Octava Micro uses five controls—a fuzz-circuit pushbutton and volume, master blend, filter, and drive knobs—to cram an updated take on the analog octave-up circuit from Pigtronix’s Disnortion into a housing with proportions roughly the inverse of its havoc-creating potential. While the fuzz is unfortunately not independently footswitchable, the Octava Micro is capable of lardaceously huge tones even with fuzz disabled, thanks to the powerful drive section at the beginning of the signal path. With fuzz engaged and extreme blend and drive settings, the Octava becomes far more than just an octaver. The blend knob determines how much classic-toned octaving goes into the mix—vintage-flavored tones that’ll remind some of Hendrix and Trower—while the low-pass filter control lets you brighten or tame EQ response for different pickup types. And the volume control packs serious amp-driving wallop. With fuzz engaged and extreme blend and drive settings, the Octava becomes far more than just an octaver, going from ring-modulator-ish sounds that eff-up certain scale intervals in a deliciously unpredictable way to transforming just about any guitar—including my vintage-voiced Tele—into a doom-rock/metal bludgeon. Ibanez is well known by many for their range of more affordable instruments. For others, the guitar juggernaut is also renowned for the boutique offerings from their custom shop in Japan, where players seeking added amenities to Ibanez templates can request whatever their hearts and ears desire. Over the last few years, the unhindered minds in the custom shop have collaborated with Stephen “Thundercat” Bruner, arguably one of the most creative bassists in modern music. His singular style and aesthetic unpredictability inspired Ibanez to develop an instrument with classic looks and contemporary components that would satisfy his sonic needs. Originally intended as a one-off signature instrument, Bruner’s growing popularity and the growing curiosity of gearheads encouraged Ibanez to release the TCB1006. Maple is the wood of choice for the imposing hollowbody, with quilted for the top and curly for the back and sides. A substantial maple tone block stabilizes the body and transmits string vibrations. Equally large in stature is the TCB’s 5-piece maple and purpleheart set neck. A rosewood fretboard balances the brightness of the maple body while providing visual and sonic warmth. The bass is finished in a matte autumn leaf burst, and the binding, acrylic blocks, and gold Hipshot hardware are also nice decorative touches. There are a wide variety of bass sounds in Thundercat’s music, which often incorporates effects. And the TCB’s electronics package provides him easy access to his tonal palette. A pair of EMG 45HZ humbuckers are at the core of the sonic command center and they’re controlled by the selector switch located on the upper bout of the body. Volume and tone are managed with the top two dials. Hopefully, I’ve made it clear that everything about the TCB is big. It was somewhat of a challenge to wrap my large hands around the wide neck when I first pulled the 13-pound beast from its case. While I did feel some initial trepidation wielding this mighty instrument, my concerns were alleviated by the TCB’s construction. Our bass had excellent balance and easily held its position, whether seated on my thigh or hung on a strap. It did take a little time to adjust to the string spacing, but the fretboard design catered to the shape of my fretting hand and encouraged stress-free motion. Not only did this allow me to focus on navigating the expansive terrain of the fretboard, but I could also incorporate a floating thumb technique with my plucking hand to suppress sympathetic string vibrations on the 6-stringed monster. Ibanez set up the instrument quite nicely, with low action and nearly flawless intonation. Although the width of the neck was intimidating, its flat profile made it easy to move around the fretboard. It took a little time to adjust to the string spacing, but the fretboard design catered to the shape of my fretting hand and encouraged stress-free motion. The TCB came strung with flatwounds, which felt great and enhanced string shifting. After some study of the TCB’s electronics, I plugged the bass into a Bergantino B|Amp pushing an HD112. This cat had a mighty roar, with thick tone and acoustic snap. The passive EMGs delivered stout mids and lows, and the tone control provided presence or warmth at the turn of the dial. Combining the magnetic pickups with the piezo certainly expands the TCB’s tonal flavors. To my ears, the piezo’s mid setting worked best when using the piezo on its own, as the EQ setting conveyed the acoustic properties of the large-chambered body. I felt the dark EQ setting worked best with the EMGs engaged, finding that it gave bass notes a bigger foundation. I took the TCB1006 to a songwriter show where its giant presence drew the eyes of many onstage and off. Teaming the bass with an Ampeg SVT made for a mighty pair—full sounding but not obnoxious. It supported the original music with authority. Soloing the bridge pickup while turning down the tone control and piezo volume made 16th-note runs punchy, which blended well with some of the more synth-friendly tunes. Meanwhile, ballads were dynamic and full with the piezo in dark mode and the neck pickup engaged. This configuration also made the TCB’s 6th string an absolute sonic stage-crusher by providing power and drama to the climaxes of a few songs. Despite a few “clunkers” that were a result of me not playing 6-string basses very often, I still found the TCB to be intuitive, with a beautiful hollowbody voice. Allow me to cut the internet trolls off at the pass: Yes, the Thundercat bass is very big, very heavy, and very expensive. It also sounds great, looks beautiful, and represents the excellence of the top craftsmen at Ibanez. This is a signature bass—made to Mr. Bruner’s specifications—not designed to accommodate the physique of every player. That said, this versatile hollowbody could be a powerful tool for the professional bassist or the enthusiast unhindered by price. Guild has always been something of an underdog among American guitar marques. And while many of the company’s electric guitars—particularly archtops from Guild’s New York and New Jersey years—are justly considered classics, the builder’s history is also populated with maverick designs that sidestepped de rigueur electric guitar appearances to great effect. One need only to look to the Guild S-200 Thunderbird of the ’60s to see how radical Guild could get. Guild is now part of the Cordoba Guitars family, and it’s revisiting some of the more fantastic electric guitar designs from its past as part of the Korea-built Newark St. Collection. The guitars are beautifully built and faithful to the style and spirit of their vintage counterparts. They’re also extremely reasonable in price. And the new Jetstar, which joins its quirky cousin, the T-Bird, in the Newark St. line, is impressive at just under 600 bucks. Something that’s immediately apparent when strapping on Guild’s Jetstar is that the build quality is excellent—bettering many imported solidbodies I’ve seen in this price class. It’s sturdy, substantial, surprisingly resonant, and finished beautifully—lending the air of a far more costly guitar. As outfitted, the two-pickup Jetstar is configured more like the original, early-’60s S-100 Polara, which shared a body with the entry-level, single-pickup S-50 Jetstar that gives this version its name. (To further confuse matters, the S-100 Polara ultimately evolved into a more Gibson SG-like guitar in the late ’60s). Our demo model came in black with a coat of sleek, glossy poly finish. The black contrasts nicely with the massive tortoise pickguard that eats up most of the Jetstar’s treble side. While the funky body shape and graceful 6-in-line-tuners headstock retain the profile and dimensions of its vintage predecessor, Guild made some fundamental changes to the Jetstar recipe so it’s more universally appealing and modern. These updates include a 25 ½" scale length in place of the original’s 24 ½" scale, and a Tune-o-matic bridge and stop tailpiece replace the Hagstrom-style vibrato unit on the original S-100 Polara and the funky fixed-bridge assemblies of the S-50 Jetstar. The Jetstar’s control set is simple and functional: volume and tone, plus a three-way selector switch. However, as a player that keeps his picking hand close to the bridge, I found the pickup selector located a bit far away for my liking. The LB-1s are lively and articulate, striking a sweet balance between delivering the output to really sting and retaining a smooth top end. The current Jetstar sports a pair of Guild’s new LB-1 “Little Bucker” mini-humbuckers, while the original had single-coils. The LB-1s feature the handsome stamped-nickel covers that are a signature of Guild’s cult-favorite ’buckers. The LB-1s are lively and articulate, striking a sweet balance between delivering the output to really sting and retaining a smooth top end. The brightness is likely tamed somewhat by the Jetstar’s sizable mahogany body. But the basic pickup tones still cut nicely through a dirty, overdriven signal and are bouncy and warm through a clean amp. The new Jetstar’s mahogany neck is a very comfortable shallow-C shape, with just enough meat to be an agreeable middle ground between chunky ’50s and ’60s profiles and slimmer necks. While the neck shape probably won’t thrill players closely aligned with either camp, it is certainly not distracting either. The pau ferro fretboard’s 10" radius is also a comfortable medium between vintage Gibson and Fender radii, and enables easy bends and athletic fretwork without sacrificing the guitar’s vintage vibe and feel. The fretwork, by the way, is truly exceptional for a guitar in this price range and adds significantly to the instrument’s excellent value. The 22 “narrow-jumbo” frets are nicely crowned and expertly rolled into the edges of the guitar’s fretboard. Big bends on the Jetstar are easy and smooth, and chords ring out bold and full. The excellent craftsmanship is also apparent at the neck joint, which is mated to the body with a joint so flush that I initially wondered if the guitar featured neck-thru construction. Between the airtight neck joint, sturdy bridge setup, and serious body mass, the Jetstar is an exceptionally lively and resonant guitar. At an onstage blues session, the Jetstar came alive through a dimed Fender Champ. The sounds were stinging and snappy, combining the swat of a Telecaster with mass and authority not unlike a Gibson Firebird. Strung with .010s, the Jetstar was very balanced—slinky enough to really rip on, yet stiff enough to feel great for percussive rhythm work, for which the mid-centric LB-1s are a perfect fit. The Jetstar was happy with a nice fuzz—particularly Fuzz Face-derived circuits. (I used an EarthQuaker Devices Dream Crusher.) The articulate, almost single-coil-like sounds lent clarity to the fuzz with the guitar volume knob rolled back, and at full volume, the combination didn’t get muddy like many mahogany-bodied instruments with humbuckers will. The Jetstar is a wildly styled throwback with a fantastic balance of modern appointments and retro charm. While it pays careful homage to its vintage predecessors in many details, this contemporary version of the Jetstar is superior to any vintage example that I’ve played. The Jetstar is refined and versatile enough to be a primary guitar. And the high-quality build and super-accessible price make it an absolutely screaming deal. At a little less than $600 with a gig bag, you can’t go wrong! Clever marketing terms such as “tube-like” and “tube-sounding” abound while shopping for an overdrive. Rather than clipping diodes, Greece’s Crazy Tube Circuits opted to keep it real for the true-bypass Locomotive: The heart of the purple pedal’s drive circuit is a 12AY7. The control set includes gain, tone, clean (unaffected signal), and mean (drive level). I plugged in a P bass converted to B-E-A-D stringing/tuning and set all the dials to noon for starters. The pedal expressed a convincingly natural and warm breakup out of the gate, and with a bump of the tone dial to 3 o’clock, I was quickly in a happy place. The Locomotive, however, delivers a wide range of gain flavors, and I found plenty more to like with both its raunchier and subtler sounds. The pedal paired well with my pushed solid-state G-K, and I was impressed with the sensitivity of the tone dial and overall dynamic response and clarity. Though things naturally thinned out when I maneuvered the pedal into “meaner” grind-y territory, it still maintained its natural and warm characteristics to a relative degree. I didn’t have a different tube on hand to swap in, but a cool thing about the Locomotive is just that. The 12AY7 can be replaced with any standard dual triode (like a 5751) to explore more tube flavors. If your OD tastes lean more classic than modern, the Locomotive is a train journey worth exploring—provided you can afford the ticket. 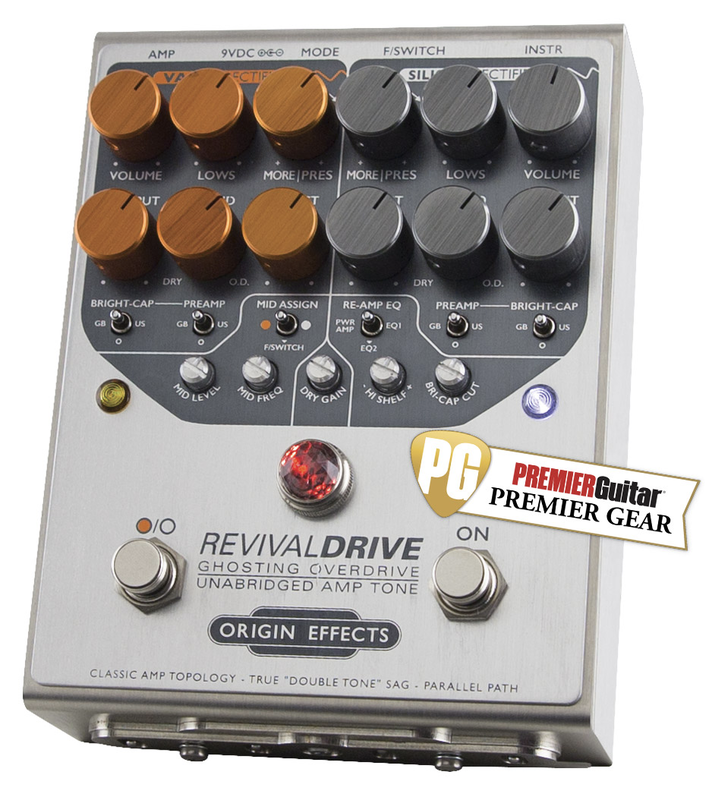 For the demo clips, I plugged the RevivalDRIVE straight into my DAW via a clean preamp. For Clip 1,I routed the signal through a Reamp into a clean-toned Marshall “Bluesbreaker” clone miked with a Royer R-121. The amp’s setting never changes, nor does the guitar. For Clip 2, I used speaker emulators, compression, and reverb within my DAW. (I didn’t try to mimic the tones of Clip 1, so the results sound very different.) Clip 3 is the raw sound of the RevivalDRIVE recorded direct, without any downstream processing, included just so you can hear exactly what the pedal contributes. Line 6’s new Powercab series aims to add some air—literally—to the sound of your Axe-Fx, Kemper, Helix, or any other digital amp simulator. I dived into the Powercab 112 Plus, which offers more advanced features than the 112, such as an LCD screen, 128 user presets, MIDI, and a USB audio interface. The first thing I noticed, besides the hefty build quality, was how loud the cab is. Along with a custom-designed 12" coaxial speaker and a 1" HF compression driver, it sports a 250-watt power amp. It’s loud. There are a few different modes for each preset: flat (for using the cab/mic settings in your modeler), speaker emulation (six options), and IR (for use with your own impulse responses). My immediate reaction playing through the Powercab was that it really feels like an amp, with all the physicality and feedback you’d expect from a traditional cadre of glowing tubes. However, be prepared to spend some time in the menus in order to get the right volume level for your gig. In hi-gain settings, the clarity and presence were impressive and punchy. Each speaker emulator adds some character to the sound. My favorite presets were “Green” and “Bayou,” which emulate a Celestion Greenback and an Eminence Patriot Swamp Thang, respectively. In all, if you really need digital-modeling diversity but love tube-amp sensitivity, Powercab might just bridge the “feel” gap. If I had to pinpoint a single quality of Spacemen stompboxes that makes them worthy of the hype and sky-high resale prices, it’s a sense of feel. Of course, that doesn’t pinpoint much of anything, because the “feel” component of a Spacemen pedal experience typically transcends any one meaning of the word. Certainly there’s the physical heft and solidity of the pedals themselves, and the engraved panels and gem lamps that evoke ’60s outboard studio gear and aviation-spec instruments. There’s the immediacy and responsiveness that makes single notes and overtones feel startlingly alive. And the way the pedal’s controls interact with your tones and each other—a nebulous, drifting, exploratory feel that paradoxically enables super-precise tone sculpting. Though the Mercury IV Harmonic Booster delivers satisfying experiences on each of these fronts, it’s the last two—those sensations of fluid, illuminated musical and mechanical interaction that distinguish this latest evolution of the Mercury line. Mercury IV enhances the sound of your guitar, amp, and other pedals in overt ways and barely perceptible ones too. And its capacity for exciting and enlivening guitar tones can make Mercury IV feel as powerful as an expensive outboard compressor or preamp. I’ve written at length about the quality and aesthetics that distinguish Spacemen pedals in other reviews. It’s more of the same with the Mercury IV. The engraved panel makes you feel like you’re dialing in a vintage Fairchild limiter aboard an X-15 cleaving the stratosphere. The switches and knobs respond with precision and smooth, perfect resistance. Inside, the circuit board is a feast for the eyes—all well ordered and immaculately seated components on a reflective foil surface that looks lifted from Warhol’s Factory circa ’66. The myriad components also hint at the depth and complexity of the tones within. That the tactile pleasures of navigating the Mercury IV are numerous is a good thing, because the function of individual controls is not always clear. The “boost” knob, which enables access to as much as 35 dB of extra kick, is the easiest to grasp. The “harmonics” control, however, can be subtle, even vague, depending on the context. The “high” and “low” toggles, with positions marked by small hash marks of varying thickness, are ultimately easiest to sort through trial and error. The set of hash marks under each one indicate areas of EQ emphasis— with thicker hash marks corresponding to the bassiest sounds, and so forth. But there is little specific explanation of what you’re adding or subtracting with these switches. If you savor the experience of navigating controls intuitively and letting your ears be your guide, the Mercury IV is a joy. Players that prefer knowing what frequency they’re manipulating down to last megahertz may be less thrilled. Even at settings least suited to a given guitar, the pedal adds air and dimension and animates overtones. For all the Mercury IV’s nuances, countless potential tone colors, and sometimes perplexing functions, it’s a breeze to just plug in and get great sounds. Even at settings least suited to a given guitar, the pedal adds air and dimension and animates overtones. And it usually takes just a few exploratory flicks of the toggles and a little twist of the harmonics knob before you start to hear tone improvement and sense the range and sensitivity of the controls. Much of the pedal’s magic hides in overtone details that are, yes, almost felt more than heard. In the case of the harmonics control, its nuances and sensitivity to the other controls are most apparent in big amps at high volumes. And my most satisfying experiences with the pedal transpired when I hooked it up to my Bassman piggyback blaring away at concert volume. 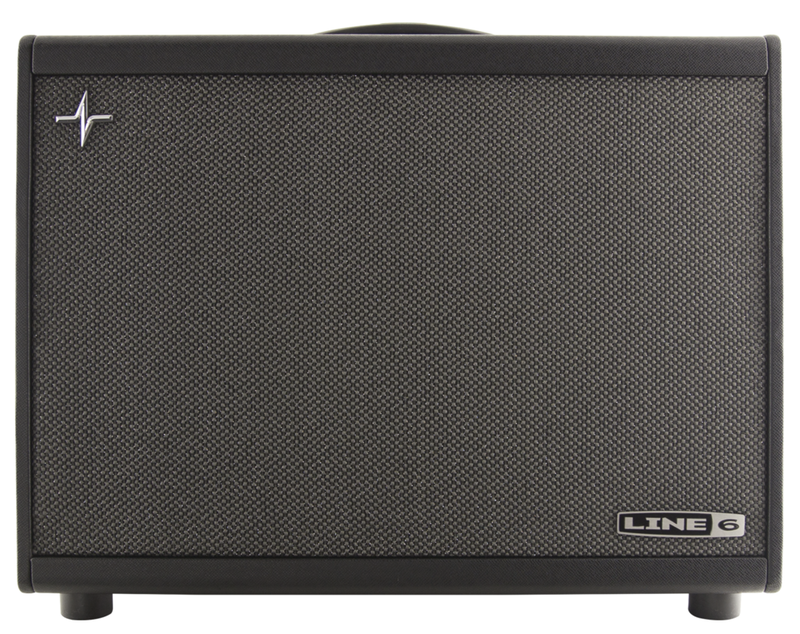 The Bassman has hints of 50-watt Marshall plexi in its harmonic makeup. But typically, they’re overshadowed by the amp’s softer attack and substantial, contoured low end. Boosting high-mid content via the Mercury IV’s switch array and the harmonics control illuminated those facets of the Bassman’s harmonic spectrum brilliantly without sacrificing any of the amp’s low-end potency. And I wouldn’t be exaggerating if I called the effect transformative. Mercury IV gave the Fender a more aggressive, oxygenated and combustible voice that I’m not sure I’ve ever heard in quite that way. Mercury IV’s effect on small amps can also be profound. You won’t necessarily hear all of the pedal’s full-spectrum overtone magic through an 8" speaker at apartment volume. But you can plainly perceive the sense of extra size and dimension that it lends. You can also still experience the Mercury IV’s capacity for reshaping effects and pedal chains. Mid-forward overdrives can be massaged into fatter, fuller versions of themselves. Fuzzes with high octave content or toppy tone signatures can take on smoother, more muscular voices or be driven to explosive teetering-at-edge-of-feedback extremes. Even delay and modulation effects with pronounced overtone colors can be manipulated to de-emphasize or highlight such quirks. Mercury IV’s tone-sculpting potential is impressive and expansive. And its capacity to be both masseuse and provocateur to your guitar, effects, and amplifier with equal aplomb is uncommon. Exploring it’s refined voices and malleable, adaptive nature led me to imagine a much more streamlined pedalboard—and many fewer backline headaches. But a pedalboard maximalist could just as easily find a place for its rich, sublime boost and overdrive colors and thrill to its positive influence on other pedals. Indeed, there a few musical devices that Mercury IV can’t transform into a fuller, richer, more beautifully sculpted version of itself. When I was starting out on guitar a few too many decades ago, I’d sometimes spot used Sound City amps in guitar shops—and run the other way. It was solid-state crap—just the sort of stuff a shifty salesperson would try to unload on an ignorant kid. And I was an ignorant kid. I had no idea that Sound City had made cool amps in the 1960s. Those original amps were created for and named after Ivor Arbiter’s London music shop. Playing catch-up with fellow retailer Jim Marshall and his bold new amps, Arbiter hired Dave Reeves to design competitive models. But not long after, Reeves moved on to create the historic Hiwatt brand, while Sound City amps slid into mediocrity. Last year Steve Fryette and Neal Ostberg of Fryette Amplification acquired the Sound City name. The 30-watt 1×12 SC30 combo is their latest effort. It’s not based on a particular vintage model, but it definitely provides a mid-1960s playing experience, with an emphasis on power tube distortion. The SC30 doesn’t sound quite like an old Marshall JTM45, but anyone who digs “Bluesbreaker”-style amps should feel right at home here. The ’60s amps that inspire the new Sound City line have separate bright and normal channels. Here, though, there’s a single input, with separate controls for the internally jumpered channels. 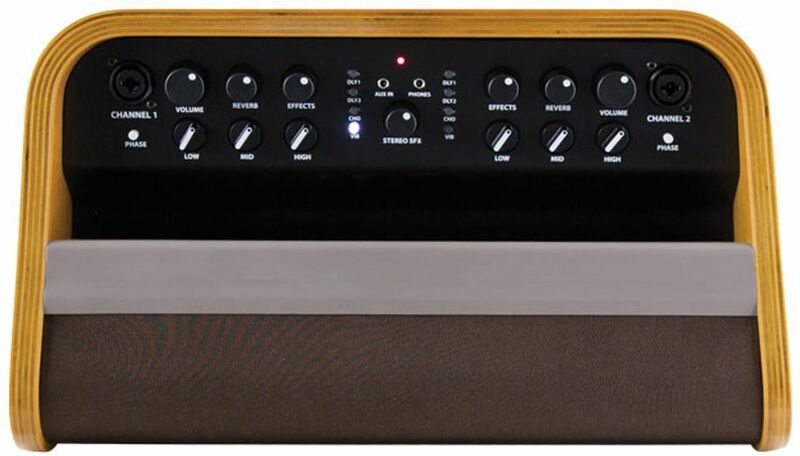 There are bass, mid, and treble controls, plus a wet/dry knob for the amp’s juicy spring reverb. That’s it—pretty darn simple. Nonetheless, the SC30 provides a phenomenal range of tones. Its clean colors balance formidable low-end girth and airy sparkle. They’re hyper-articulate, transmitting every dynamic variation, every brush of fingernail or scrape of pick. Nuanced players will love these nuanced sounds. Nuanced players will love these nuanced sounds. Tones get crunchy when you raise the two volume controls toward their midpoints. You can summon many shades of distortion by adjusting the relative brilliant/normal levels. At high volume, tones are massive, with glorious power-amp saturation and seemingly eternal sustain. Yet even with the volume knobs cranked, tones retain powerful upper-mid presence and snappy response. These sounds aren’t tight in the modern hard-rock/metal sense, but they get closer to that sensibility than many ’60s-style combos. The lack of a master volume control is a double-edged sword. It means you’re working with rich power-tube distortion, not buzzy preamp gain. But it can be hard to access low-volume crunch without adding a power attenuator or load box. The SC30 is loud for a 30-watt amp, and it sounds so good when it’s working hard that you’ll probably want to let it. This is a hot amp in every sense—you can feel the heat coming off the chassis. (The power tubes are cathode bias, which results in higher operating temperature). Some of the SC30’s character stems from its dual KT66 power tubes. (You can substitute 6L6s or 5881s without re-biasing, though I didn’t test these options.) Compared to, say, the EL34 tubes found in many Marshall amps, KT66s are slower to distort. Their highs have more chime, and their lows have more punchy definition. It’s a hi-fi sound relative to, say, the grinding, midrange-forward character of plexi-era Marshalls. The EBow string sustainer is a great tool for lending mystery to a song and extracting yourself form a same-old-solo rut. TC Electronic’s AEON is the first real hand-held rival to the EBow. And its relatively accessible price makes it a cool option for casual users on the fence about an effect they’ll use sparingly. Like the EBow, the AEON uses an 9V battery-driven electromagnetic field to vibrate a guitar string. It’s intuitive and easy to use, though a few techniques are critical to making it work and sound best. Two contoured channels serve as string guides to assure that the string stays in the center of the electromagnetic field. Situating the AEON at the vibrational sweet spot along a string’s length is also critical, though shifting that placement generates expressive variations in intensity. AEON is a cool study in design economy. There’s a clip to hold the battery rather than a compartment and a single push button activates the effect. But while the brushed aluminum enclosure prevents slippage in sweaty hands, a few simple ergonomic improvements like thumb and finger divots could make it more comfortable. Those minor gripes aside, AEON is a blast, and an easy way to expand your guitar’s expressive potential. 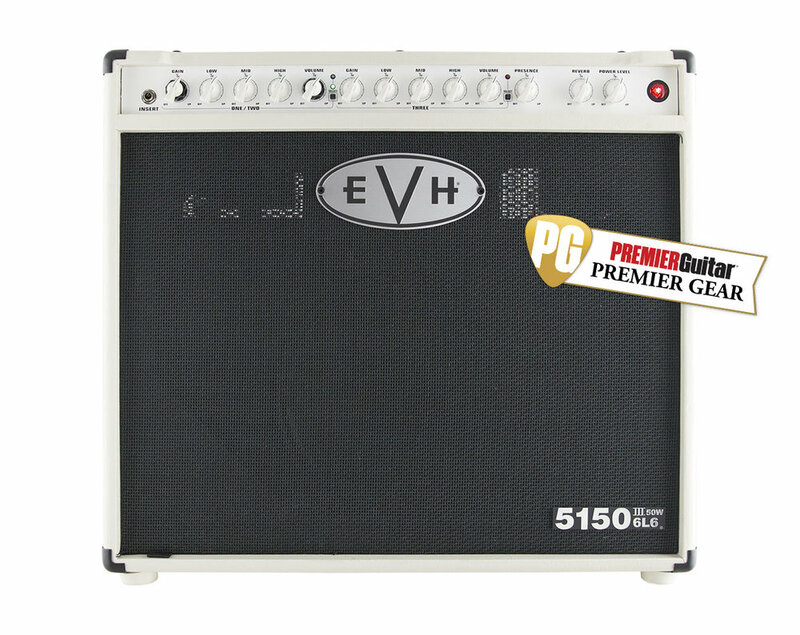 The latest incarnation of the EVH 5150III adds a significant upgrade: namely, independent volume and gain controls for the clean and crunch channels. On past models, shared gain and volume controls for the clean and crunch channels made it tricky to make the clean channel clean enough and still have enough grit for the crunch channel. This revision solves that issue—and significantly expands the amp’s potential. When I pulled the amp out of the box, the first thing I noticed is that this combo is heavy—lifting and carrying it by the center handle isn’t exactly easy on the wrist. Thankfully, the folks at EVH are aware of the amp’s heft, and included casters that can be attached to the amp. The all-tube, 3-channel amp (clean, crunch, and lead) features seven ECC83S preamp and two 6L6GC power-amp tubes. A Celestion 1X12 speaker lurks inside the 7-layer, birch-ply, closed-back cabinet. The front panel sports mini push buttons to select between channels. There are two sets of controls for gain, low, mid, high, and volume. But channel one and two (clean and crunch, respectively) share the leftmost set via a smart concentric knob design that gives you independent control of each channel. There are shared controls for master, presence, reverb, and power level (the amp can generate 1 to 50 watts). Usually, “crunch” channels connote rhythm playing. But this crunch channel was equally crushing for leads—particularly with humbuckers. The rear panel has jacks for headphones, MIDI in, effects loop send and return, preamp out, and two speaker outputs, as well as a master resonance knob. There’s also a load impedance switch to allow you to select from 4, 8, or 16 ohms. I started my own test using the clean channel, with gain at 10 o’clock and all EQ knobs at noon. While the clean wasn’t exactly pristine, the tones were super robust, thick, and singing. Fender, who set the standard for clean tones with amps like the Twin Reverb, are partners with EVH, and the EVH III’s clean tones are as detailed as those from many Fender amps that specialize in clean voices. In some settings, I preferred the clean colors from the EVH. And the appeal of these sounds has the potential to resonate among a lot of players apart from die-hard Van Halen fans. The EVH’s beautiful DSP reverb, by the way, is spacious and angelic, with a long decay. It’s a nice match for the clean channel and certainly adds to the vibrancy of those tones. It is among the best onboard digital reverbs I’ve heard in an amp. Over on the crunch channel, you’ll hear a fair amount of grit even at the lowest gain levels. With all EQ knobs at noon, “Ain’t Talkin’ ’Bout Love”-type, arpeggiated figures sounded perfectly aggressive and detailed. With the gain up at noon, the amp really started to roar—producing classic, brawny “Panama”-style rhythm tones. Usually, “crunch” channels connote rhythm playing. But this crunch channel was equally crushing for leads—particularly with humbuckers. Imagine that archetypical hot-rodded Marshall from the ’80s, and that’s what you more or less get here. Even in this 1×12 configuration, the amp sounds and feels massive. It’s easy to overlook the virtues of a good acoustic amplifier. Having one isn’t essential to enjoying your guitar at home or around a campfire. And any performance space with a microphone (or two, if you sing) and a PA will probably get your performance over to the crowd. But if you’ve ever experienced the indignities of playing through a junk PA, you know that a little extra control over your performance situation is a very nice thing. And if you’re not willing to incur the inconvenience and expense of your own PA and DI, an acoustic amp is a good way to go. Fender’s Acoustic SFX is a very good acoustic amp—rich sounding with a functional stereo speaker array and a selection of effects that make it sound downright expansive at times. But it also manages the neat trick of being a sort of all-in-one acoustic performance “mothership” without being bogged down by bells, whistles, and sound optimization tools that are tricky to use on the fly. I was equally—if not more—impressed with how high levels of the second speaker added headroom and flexibility to the EQ controls. Sonic Redistribution The Acoustic SFX is not Fender’s first acoustic amp to feature the SFX (stereo field expansion) technology. Two previous iterations of the Acoustasonic line featured the stereo sound distribution technique devised by Aspen Pittman and Drew Daniels. In brief, the SFX system is based on a forward-facing speaker and a second, smaller speaker that’s situated below and at 90 degrees from the forward-facing driver. The front-facing speaker receives and broadcasts the sum of left and right signals. The second, smaller speaker receives a left-minus-right signal. While the speakers are technically rendered out of phase, what you hear is not thin phase cancellation but a wider signal that’s divided into component parts and redistributed in a wave of sound that arrives at the ear as a more detailed sonic picture. Fender incorporated the SFX speaker array into the cabinet design beautifully—creating small portholes on either side of the amp and a rectangular port on the rear. Thoughtful design abounds elsewhere. The entire topside of the amp just forward of the control panel is a very confortable, contoured handle. The cavity between the handle and the control panel functions as a cool little stash box where you can put slides, picks, or whatever device you might be using for backing tracks or between-set tunes. The curved 9-ply wood cabinet, meanwhile, looks like it was lifted from an Eames chair. The control set is a straightforward affair that’s pretty easy to navigate. There’s a single volume knob, a three-band EQ, and reverb and effects-level controls for each of the amplifier’s channels. Each channel has a phase button if you run into trouble with feedback. The third, middle set of controls is for the amp’s effects and the SFX functionality, which, as we’ll see, enhances the sound of the amp in profound ways. The effects set includes a simple one-repeat delay, a multi-repeat delay, chorus, and vibrato. Each is tap-tempo enabled and can be bypassed via an optional footswitch or by turning the effects knob to zero. The SFX knob is essentially a level/balance control that determines how much sound is distributed to the side-mounted speaker. But its character shifts considerably depending on how you set the effects and at what level. The back panel has a pretty standard set of acoustic amp I/Os (balanced XLR out, combination XLR/1/4" mic/line inputs), a voltage selector, and a footswitch jack for remotely bypassing the effects. Acoustic Architecture in Practice In it’s most straightforward setup and at the lowest possible SFX settings, the Acoustic SFX is a great blank slate for most acoustics. I used a mahogany Martin 00-15 and Gibson J-45 with L.R. Baggs Element pickups. And while the amp seemed to favor the Gibson’s balance of low end and patina’d highs to the Martin’s more compact, sparklier personality, the EQ controls provided ample headroom to dial up very pretty approximations of each guitar’s voice. Dialing in the SFX function pays big dividends, though, and I often wondered why one would ever opt to dial out the function entirely. While Fender makes much of the way the SFX design works with the reverb and effects to add extra dimension, I was equally—if not more—impressed with how high levels of the second speaker added headroom and flexibility to the EQ controls, which are typically the hardest thing to dial in right on an acoustic amp. At high stereo SFX settings, the amp’s intrinsic high-end sensitivity was more apparent, but so was an extra bit of presence and air that made the high end of both guitars sound less boxy. Dialing in a high/mid setting that eliminated crispy, clacky picking artifacts without totally diminishing the sparkling overtones was relatively effortless. And bass sounds took on a warmer, more atmospheric edge that enabled me to reduce the already ample bass response. If you move between performance spaces of varying size, the added headroom and dimension the SFX function adds to the EQ controls can be invaluable. And if you use a lot of low-tuned alternate tunings, that extra dimension and enhanced frequency balance can enliven overtones in beautiful ways. The effects, while not spectacularly rich, deep, or colorful, work well with the amp’s basic voice. The reverb, in particular, is quite nice at mellower settings. I especially enjoyed mixing it in with a little of the multi-repeat delay for atmospheric chord arpeggios. If you like things especially spacy, the Acoustic SFX effects will go there, although they sound less warm at higher levels. The Verdict There’s much to like about the Acoustic SFX. It’s stylish, functional, and delivers ease-of-use and true sound-sculpting potential at a price that’s still well south of many other professional grade acoustic amps. There’s room for improvement here and there: The high midrange could be a little softer and more contoured, for instance. But the ample headroom and cool SFX-derived sounds make this amp a very solid and reliable gigging partner. It’s no secret that many “artist signature” guitars aren’t all that different from a company’s stock models. Jigger with surface cosmetics, maybe tweak the electronics a bit, and voilà — you’ve got a “new” model to sell at an upmarket price. Music Man’s St. Vincent is nothing like that. Designed top to bottom by Annie “St. Vincent” Clark with help from the Ernie Ball/Music Man lutherie team, the instrument is as bold, imaginative, and thoughtful as Clark’s extraordinary guitar work. Old-School Modern The St. Vincent’s angular, geometric body is unapologetically Modernistic—and that’s upper-case “Modernistic” in the mid-20th-century-design sense. Guitar history geeks will probably flash on 1957/1958, when Gibson created the Flying V, Explorer, and Moderne. Designed by visionary Gibson honcho Ted McCarty, these instruments (along with 1963’s Ray Dietrich-designed Firebird) aimed to update Gibson’s then-stodgy image with a bit of Fender’s space-age panache. The St. Vincent weighs a mere 7 pounds, thanks to its svelte, slim-waisted body. It’s a great choice for players of smaller stature, or anyone whose back or shoulders object to overweight axes. Slight but Solid The St. Vincent weighs a mere 7 pounds, thanks to its svelte, slim-waisted body shape. It’s a great choice for players of smaller stature, or anyone whose back or shoulders object to overweight axes. But despite its modest weight and slender proportions, nothing about the St. Vincent feels insubstantial. The stout rosewood neck has a 10" radius and a relaxed D shape. Its back is only lightly oiled, providing a raw-wood feel and a solid grip. The 25.5"-scale fretboard has 22 immaculately installed and rounded frets. The fulcrum-tremolo bridge is geared for quick, Van Halen-esque deep dives, but it’s also capable of subtle vibrato under an ultra-light touch. Pitch stability is about as good as it gets on guitars without locking trems. (The locking Schaller tuners help, as does the expertly installed and intonation-compensated nut.) Build quality is excellent across the board. There are many cool cosmetic details, including the vertically oriented pickguard, triangular knobs, and interlocking-circle position markers. The only visual misstep for me is the standard Music Man headstock. I dig its compact yet elegant shape and offbeat 4+2 tuner layout, but to my eye, at least, its relaxed curves and pearloid tuner buttons don’t quite harmonize with the body’s clean angles and stark white plastic hardware. Having said that, the dark shade of the neck and headstock makes these elements recede into the background. Your eyes can’t help but focus on the bold blue body. Wicked Wiring The guitar’s electronics are as unconventional as its angles. Clark opted for three mini-humbuckers—shades of Gibson’s Firebird VII. There’s a 5-way selector switch, but the pickups aren’t wired Strat-style. Positions 1, 2, and 3 solo each of the pickups. Position 4 combines all three pickups in parallel, while position 5 blends the outer two. You can’t get the sound of two combined adjacent pickups, as from Strat positions 2 and 4, but that’s cool—the all-three setting provides crisp, articulate “out-of-phase” sounds, and the neck and bridge harmonize gloriously. I confess I’ve never owned a mini-humbucker guitar. These DiMarzios sound terrific, but it took me an hour or two of playing to get the hang of them. They have a snappy, focused attack compared to conventional humbuckers, and a more hair-trigger tonal response. They can seem dark at times, yet highs can erupt violently when you dig in. Once you get acclimated, though, they can be extraordinarily dynamic. Just be aware that they respond differently than most humbuckers or single-coils. Nor do they behave like P-90s, though, like P-90s, their clean tones tend to be rough-edged and “furry” relative to single-coils, while distorted tones usually have more snap and string-to-string differentiation than on humbucker guitars. The St. Vincent doesn’t lack low end power, but macho chunk isn’t its strong suit. Heavily overdriven tones tend to evoke early Zep or AC/DC, with crisp attack and strong note definition. Nor is the guitar terribly twangy—clean tones maintain bulk, and you never get anything quite like, say, a soloed bridge pickup on a Strat or Tele. But these aren’t complaints. I dig the St. Vincent’s unique voice and the way it adds new colors to your palette. And whether you play clean, dirty, or in-between, you’ll appreciate the excellent intonation and rich, ringing sustain. The Verdict Annie Clark’s signature model is visually striking. But its distinctiveness is more than skin-deep. Its superb ergonomics are perfect for players seeking a big-guitar sound from a light, lean-bodied instrument. The build quality is excellent. Three mini-humbuckers and unconventional wiring provide many distinctive tones, all of which benefit from the guitar’s fine intonation and great natural sustain. The price may seem steep for a solidbody with a bolt-on neck, but this is a unique new design, and the detail work and setup are fantastic. (Some skilled technician invested substantial bench time fine-tuning this instrument.) The St. Vincent is as cool, clever, and engaging as, well, a new St. Vincent album. RJM Music Technology is best known for rack switching devices, and players from Beck to Billie Joe Armstrong to John Petrucci all use the company’s high-end systems. The new, U.S.A.-built Mastermind PBC, however, shrinks RJM’s rack mount technology into a compact format designed to fit on a pedalboard and be more accessibly priced to players without Learjet budgets. The Mastermind PBC is ostensibly a control station for your pedals, but it can do much more than that—certainly more than we can cover in this review. The unit features 10 loops with insert points in between groups, which offers copious routing options. You can even run some pedals straight into the amp and others through your amp’s effects loop. Pros: Excellent, versatile design. USB editing option greatly increases functionality. Cons: A little pricey. Editor has a moderate learning curve. RJM clearly considered just about every scenario pedal junkies are likely to face. So the Mastermind PBC offers simple solutions for the most common problems. While the unit is true bypass, there are three switchable buffers that can be saved as part of any given preset. The last four loops, meanwhile, have an internal mixer so you can route pedals in series or parallel. The Mastermind PBC can also be configured for a stereo setup or for A/B routing to different amps. I took advantage of the latter option and connected one end to my shimmery clean blackface Fender Deluxe Reverb and the other to my Mesa/Boogie Trem-O-Verb. It was a pairing made in heaven. There is room to store up to 768 presets so it’s very unlikely you’ll run out of space. The readout is sizeable but not too huge—the right balance of compact and easy on the eyes. There’s even a built-in tuner (although there’s no dedicated tuner out on the back panel). Other standout features are USB connectivity, a flash storage option, and PBC Editor (for use on a Mac or PC). One of my biggest gripes with anything multi-effects related is scrolling through screens to adjust every little parameter. The PBC Editor gives you much more control over the Mastermind’s internal control parameters. Though downloading and hooking up the editor is easy, it’s not immediately intuitive. It took a little bit of time to get my bearings, and I think many guitarists coming from a world of analog pedals will have the same experience. Successfully navigating the editor comes with a significant payoff, however. The level of control is astounding, especially if you use MIDI capable pedals like the Strymon TimeLine or Mobius, or the Line 6 M series. The sound sculpting potential opened up by the editor and the seamless way it will interface with MIDI pedals is enormous. At $999 street, the Mastermind PBC is the priciest switcher in our roundup, but there’s little sticker shock when you realize how much it can do and the exponential way in which it expands the possibilities of your rig. It’s perfectly suited for a professional touring musician. But the sound shaping possibilities and the excellent MIDI and digital workstation interfacing options could just as easily make it the centerpiece of a home recording rig. Effects designers have devised some pretty clever ways to approximate the sounds of a rotary speaker. A lot of these pedals, like the Uni-Vibe, became sonic categories all their own, with cults of nitpickers that debate the relative merits of different versions. But no matter how good a chorus, vibe, or phaser sounds—no matter how hip they can sound in just the right context—they’ll never quite nail the whirling, swirling, undulating properties of those original spinning, mechanically modulating leviathans. Pedal designers, however, are nothing if not a stubborn bunch. And in the never-say-die quest to build a Leslie in a box, digital magicians have closed the gap. We’ve seen some great digital rotary simulators in recent years like the Strymon Lex and Neo Instruments Ventilator, but the compact and killer sounding DLS RotoSPIN is right up there with the best. It’s good enough to be downright indistinguishable from a Leslie in the right recording environment. And when used to the full extent of its capabilities, it sounds captivating and convincing on stage, too. Power to Swirl There are days when anything more than a two-knob fuzz looks like a headache to me. And the day I opened up the DLS was one of them. But what you find out fast is that this set of controls is intuitive to the point of being dummy proof. Two knobs on the upper left set the respective speeds of the slow and fast modes. The two just to the right of that control the intensity and level of the virtual rotating tweeter and bass rotor (or horn and drum, as they are better known in some quarters). As we’ll see, these controls are very interactive and much more (and often more subtle) than simple volume controls. The tweeter and bass rotor controls are understated rather than transformative. Given how nice and realistic the basic rotary voice is, that’s no bad thing. The lower left ramp knob controls the rate at which the virtual rotor rotations come to full speed when you switch between slow and fast speeds. Just to the right of that, there’s a gain knob and a switch that engages the drive channel. Two footswitches are for bypass and the fast/slow modes. You could work with these controls exclusively and get plenty of great sounds out of the DLS. But there are a lot under-the-hood tweaks you can make to fine-tune the pedal for your rig. Some of the most effective controls relate to the stereo outputs, which have their own unique sonic qualities. Output A is voiced to be fatter. Output B is brighter. But they also have their own internal volume control pots, which can change the voice and the way the pedal interacts with the amp you put at the other end. Yet another internal pot enables you to increase the intensity of pitch bend (or Doppler effect, as they call it) on the tweeter. Here, again, this control can significantly re-shape the personality of the pedal. In general, the RotoSPIN seems exceptionally well built. The very busy circuit board is well ordered. And to the extent that much of the circuit must be a carryover from the larger DLS RotoSIM, it’s surprising that it’s as tidy as it is and has room for the input gain control, two volume controls, and the pitch intensity pot. Pros: Very convincing and rich rotary simulations. Intuitive and streamlined when you need it to be. Tweakable when you need to fine tune. Versatile stereo functionality. Cons: Treblier tweeter settings can betray small traces of digital voice. No expression pedal option. Swirl On Sister! One the beautiful things about the RotoSPIN is how satisfying it is before you ever tweak or fine-tune any of the controls. The manual explains that setting all four knobs to noon effectively replicates an old Fender Vibratone. And sure enough, in the fast setting the DLS delivers the same sassy, satisfying warble of Mike Campbell’s “You Don’t Know How it Feels” textures and SRV’s queasier riffs. Interestingly, this is one setting that you can approximate pretty well with a good analog chorus on a heavy depth setting. And yet, the differences between the two effects are profound. The DLS is much more rich and complex than a chorus. The shades between virtual spin cycles are more vivid. There’s also a certain toughness and attitude to the modulations—especially with a little drive. The prescribed Leslie 122 setting is delicious and a highlight of how rich the DLS sounds compared to a chorus, phaser, or vibrato. In stereo mode this setting is heavy, gently pulsing, and dreamy—and sounds especially fat in Drop D and other slack tunings. When you stray from the prescribed formulas for Vibratone or Leslie 122/145 cabs, you start to hear how subtle and interactive the tweeter and bass rotor controls are. DLS claims they simulate properties and parameters like “width” and microphone proximity rather than just volume, and they are understated rather than transformative. Given how nice and realistic the basic rotary voice is, that’s no bad thing. At times the tweeter and bass rotor knobs feel quite like controls on an old Fender amp, which will almost exponentially emphasize bass by reducing treble. You can further tweak the character of the treble sounds, however, by adding pitch shift depth with the internal pot. And one of my favorite settings used a heavily pitch shifted but low-level tweeter setting with a more present and slightly louder large-to-mid-size cabinet setting on the bass side. This setting sounded even cooler in stereo. In fact, just about every setting sounded deeper and richer with two amps, which opens up cool possibilities related to other effects. I became addicted to the very intoxicating sound of running one of the stereo channels with a slapback delay on multiple repeats, for instance. The Verdict Good Leslie simulators tend toward the expensive side of the spectrum. So the $259 street price that DLS asks for the very smart, convenient, streamlined, and easy-to-use RotoSPIN is a relative value—even if some competitors may have more features or sound ever so slightly more authentic in isolated situations. It’s likely to hold its own and then some against the competition in the studio. 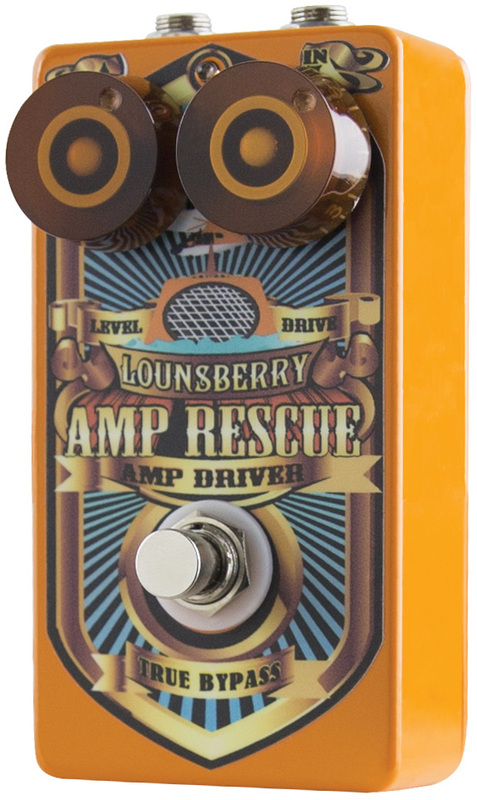 And live and loud through two amps, this rotary simulator is hard to top at any price.